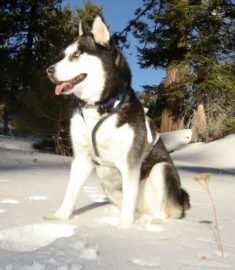 My majestic, loyal, silly, furry, happy, loving Husky Jetta aka “Hammer” has given me the most joyful 14 years of my life. I lost Jetta to cancer last May. Since then it’s been too difficult and painful to even acknowledge she’s not here. So I did a lot of deep thinking and in reflection realized that Jetta is still here through Viagen Pets preserving her genetics. It’s my belief that her precious husky spirit will never truly be gone! Jetta was a shelter dog, and I’m still astounded by the powerful impact she’s had on so many lives. Jetta’s beauty, personality, heart and temperament are in my eyes perfection. She never had a mean bone in her body, and even strangers were drawn to her magical aura. Jetta and her sister Axe were inseparable, and Axe is patiently awaiting her twin clone. As a pack, we shared exciting, unforgettable adventures together and we are ecstatic about Team ViaGen Pets reuniting us one day. Jetta had an unbelievable will to survive.